The desert is full of gorgeous estates that were built for entertaining. Many of them are homes that Golden Era movie stars owned and would escape to with their friends for the weekend. This includes historic homes once owned by Hollywood icons such as Frank Sinatra, Lucille Ball, and Merv Griffen. Palm Springs estate weddings have become wildly popular with couples from all around the globe. They are more private, and offer a comfortable setting that doesn’t feel as formal as a ballroom, but still upscale enough for a wedding. Because of the steady growth in popularity, the city of Palm Springs has made very strict rules on the use of estates for weddings and special events. Over the years we have done dozens of estate weddings in Palm Springs. After reviewing the updated event policies from the city, we can tell that it protects both the wedding host and the neighbors in the area. (And we have come across some pretty cranky neighbors, that is for sure!) It may seem like a whole lot of red tape, but if your heart is set on an estate, it has to be done and will make it so those pesky neighbors leave you alone. That is where we come in. We have built trusted partnerships with all of the management companies that handle weddings at estates in Palm Springs. We’ve worked with the City of Palm Springs (and most of the other cities in the desert at one point or another) and have already built a level of trust with them. They know we manage weddings appropriately and have minimal issues with our events. This is a very good thing for our clients, because the city and management companies like working with us, which relieves much of the pressure from our clients. Most clients hope to be able to work around some of the rules the city imposes, but it is to the point where there isn’t much flexibility from either the estate managers or the city. This includes the 10PM curfew and sound levels. The City of Palm Springs now requires a site plan and vendor insurance a full 60 days prior to your wedding date. That means you have to have your wedding team fully hired, timeline and diagrams complete along with the other details needed for their site plan 2 months out from your wedding day. If you wait too long to get a planner involved, you may not have everything done on time. Everyone you hire for your wedding will be required to have liability insurance in order to work at your wedding. (And your caterer must have both a business license and liability insurance.) Your wedding team will be held to high standards to do their part in set-up and breakdown to avoid damages that would result in damage fees passed on to you. 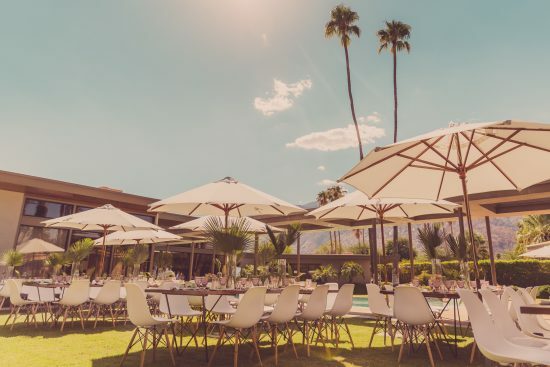 If you play by the rules, you will love having your wedding at an estate in Palm Springs. Some of our favorite weddings have been at these locations. Just remember, the rules set forth by the City of Palm Springs protect you too…and that we can help you navigate through everything with ease.